This crow was lucky to find himself with a big piece of bread — but he quickly realized he could turn it into an even bigger meal. Oren Hasson was sitting by a pond in Ramat-Gan, Israel, when a hooded crow landed nearby with a piece of bread, breaking it up into pieces and dipping them in the water before eating them. Though this isn't unusual behavior for crows, Hasson was intrigued by how meticulously the crow was doing it, and decided to keep watching. Sure enough, the crow — or a friend — returned an hour and a half later with another piece of bread and began to break it up like before. But this time he was successful — and snatched up a fish who was attracted by his bait. Hasson was stunned by the fishing crow, and returned to the park to videotape it, witnessing the behavior about 10 more times. 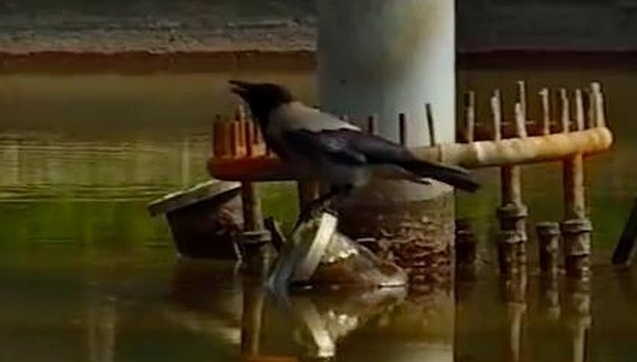 In a video, which was taken in 2000, a clever bird can be seen dropping several pieces of bread into the pond. When one large piece begins to float away, he pulls it back toward him — and is rewarded with a nice big fish. While this bird's plotting is incredible to watch, it shouldn't be surprising. Crows are remarkably smart animals — they're even on par with primates. They're adept at tool use, have used traffic to open nuts and have no trouble communicating with humans. If anything, this is just another reminder not to underestimate our feathered friends. Responses to "Amazing Intelligence: Crow Comes Up With Genius Plan To Catch Fish "